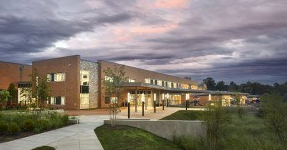 When Arlington County set out to build a new 98,000-square-foot elementary school, which opened in 2015, project managers decided to pursue a net-zero energy (NZE) performance goal. 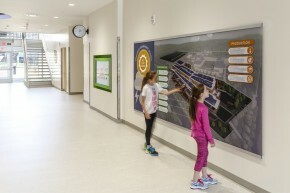 The effort resulted in the largest NZE public school in the United States and serves as a living laboratory for students, faculty and visitors on energy efficiency and the positive impact buildings can have on reducing carbon emissions. The design team for the new construction project took advantage of the topography of the site to create distinct, tiered academic zones and separate exterior play spaces for early childhood, primary, and elementary grade levels. Advanced lighting strategies including the integration of daylight and controls run throughout the buildings. Controls and monitoring culminate in a rooftop solar lab, including 1,700 photovoltaic panels, that allows students to conduct real-time and on-going experiments. Data from these experiments can be tracked and graphed using a building dashboard system accessible on any device in the school. Other efficiency features include solar thermal water heating and geothermal well-field under the school’s playing fields. Integrating the school’s technology into student learning was a primary objective of the schools design, inspiring “students and teachers to use the building creatively to facilitate everyday learning and lifelong exploration,” according to VMDO architects, who designed the school.